My puppy won’t stop biting me. He is the cutest thing on four legs, but he has a mouth full of tiny razor blades that leave bruises even through my heaviest clothes. Mosley is an adventurous, fearless puppy, and my baby. He’s teething – I get it; this too shall pass. But in the meantime, he’s driving me friggin’ insane! Besides gnawing on my hands and legs for attention, the little rascal has also learned how to barrel up the stairs faster than I can catch him. Since he refuses to become potty-trained on the second floor, he finds new and creative ways to relieve himself, before I gather up his fifteen pounds of fluffiness and haul him back downstairs. 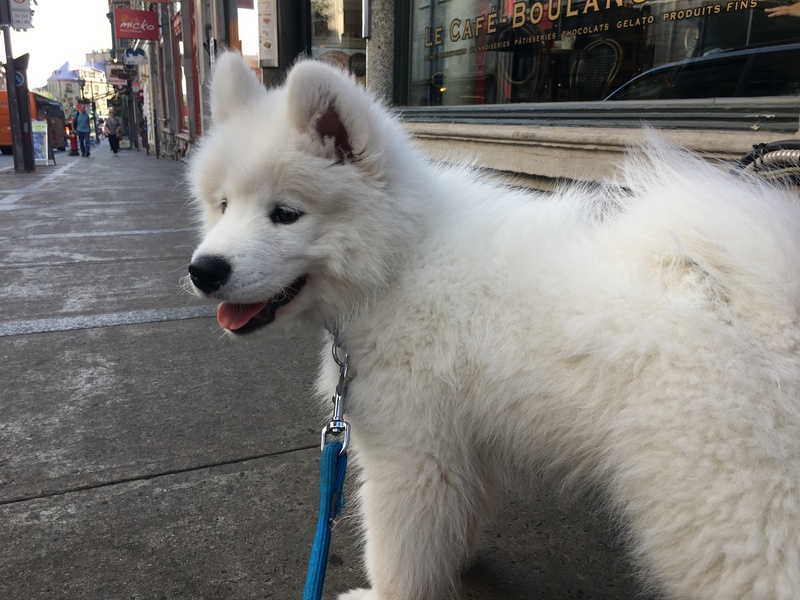 Mosley’s first trip to Old Quebec. He doesn’t like to be carried in this way, so he yanks his head around in all angles and makes a horrific sound like he’s possessed by a demon – like I said, cutest thing on four legs, but absolutely untameable. My Franco boyfriend says he’s as stubborn as a pig (not sure if that’s an English expression, but you get the point). I read as many dog blogs and articles as possible about how to get puppies to stop biting, none of which seem to work on Mosley, our little ball of demonic fluff. Finally, I came across some instructions on how to do yoga with your dog. Most of it was sheer nonsense, hoighty-toighty and ridiculous, like ‘transfer your karmic energy to your dog’ kind of stuff, but other articles seemed to be based in real science and looked actually enjoyable. And allegedly, it can calm your dog. I dimmed the lights in the living room and I put “Serenity” essential oil in the diffuser. I grabbed Mosley and set him on the yoga mat, which he proceeded to try and eat. Having no idea what was going on, he looked at me confused when I tried to arrange him in a position. Then he bit me, hard. A few months before we got Mosley, I posted a picture of Flayla, my beloved catahoula in Saskatchewan, on Instagram and wrote about how much I missed her. I called Flayla, the She-Devil, but she was the best thing in my world. Ok, so Mosley wasn’t going to become calmer because he “practised” yoga with me. He was also only three months old, so I had to admit that nothing was going to make him calmer. 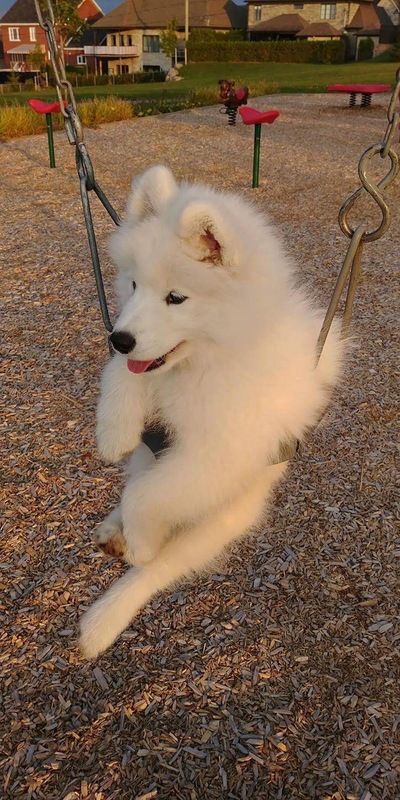 However, I love playing with him. And “doga” gave me a whole bunch of games to try out, and ideas for tricks to teach him. So I sprayed water in his face and in the sternest “no!” I could muster, I tried my best to communicate the fact I don’t like when he bites me. He wiped his nose with his paw and rolled around on my yoga mat (he really is so cute) and we tried again. 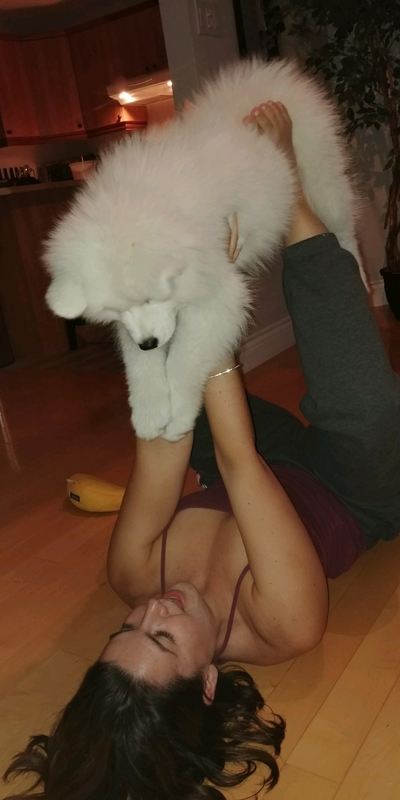 I held him up in the air, I stretched his legs at the same time I stretched mine, and I played with him, the whole time instructing him not to bite. It helped a little. He bit less, and when he did, it was softer. Mosley is no yoga master, but he is a mood enhancer, a bringer-outer of love and a family unifier. I’m anxious to get home at the end of the day to see him. He’s my baby. And most importantly, he puts things in perspective, which is exactly why we have dogs (and children). He’ll get over this biting soon enough. He’ll learn. He’ll cause me more trouble. He’ll learn some more. With a little patience, we will have a yoga routine to post here soon.